This is a test document. 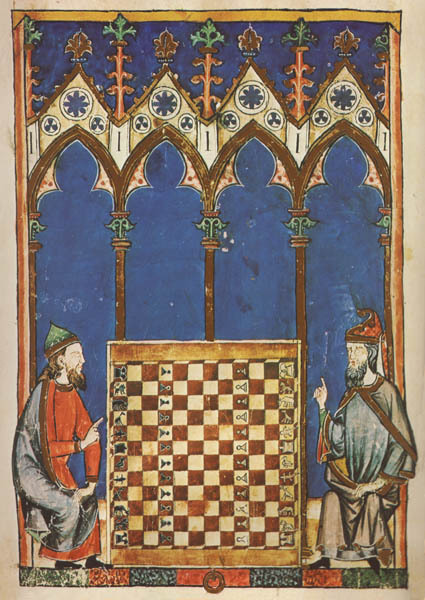 It represents an attempt to create an annotated, English language translation of the game of "Grant Acedrex" (or Great Chess), excerpted from the book "Los libros de acedrex dados e tablas" (The Books of Chess, Dice and Tables) by Alfonso X, el Sabio, as translated by Sonja Musser Golladay. For an original language representation of Great Chess, see Grant Acedrex Original Text. This document is in an incomplete, draft state. It will not be published or made public without the consent of Sonja Musser Golladay or David Howe. Revision 2: 14 Sep 2007: Updated translation. Changed Grande Acedrex to Grant Acedrex. Revision 3: 16 Sep 2007: Updated/corrected movement and initial array diagrams. Minor translation updates. Revision 4: 17 Sep 2007: Added diagrams for King and Rhino movement. Minor translation corrections. [fol. 81r] Here begins the game of great chess that was made in India after the manner of how the old kings used to make their armies of knights and pawns and array them in ranks to show their power and so that their enemies would fear them. Also, of how they used to show by there being strange birds and beasts in their armies why the men would obey them more willingly and regard them as that much more noble. Just as the common chessboard is divided into 8(x8) squares, they divided this one into 12(x12). And just as the other chess they put 16 pieces on each side for total a total of 32, they put in this one 24 pieces on each side for a total of 48. And as the other 16 chess pieces can be moved according the rolls 6-sided dice, so can these 24 in this chess move according to an 8-sided die. The King moves in two different ways. As shown near the bottom of the diagram, to any adjacent square, and (as shown near the top to the diagram) also is able to leap two squares diagonally or orthogonally. And in this game there is a king who is as the head and lord of his whole army, he leaps two squares like the fers or moves to the first orthogonally or diagonally as he wishes. And he captures, is shielded and is safe from check unless there is another piece in between. Squares marked with an "x" indicate that the square is an access square, and must be vacant for the piece to continue to move in that direction. This piece is considered a sliding piece, and so cannot leap over intervening pieces. This piece is called a Griffon in Fairy Chess terminology. And he has then next to him a bird who is lord over all other birds. And although this bird is known by many names according to the languages of different peoples, in India especially where this game was first made, it is called aanca, which means a beautiful and fearsome bird. Because as the wise men tell in their books wherever this bird flies no other bird dares to take off, and those which are in trees and caves and dare not to leave them but rather strive to hide as well as they can because it is so large that it carries the elephant and all the other large beasts it finds to its nest. And this bird is very beautiful because its chest and neck shine as though they were gilt. And it has yellow sides and wings. Its feet, eyes, and beak are red as scarlet and it has very black claws. And it has on its head a round spiked crown, like a diadem. And this bird rears its young in the highest peaks it can find and it does this for two reasons. First, it always wants clear, clean air and second, because it has short legs and long wings and so cannot take off from a low place. And whenever it wants to move to fly, it raises up as if to jump and then flies straight to where it wants to go. Thus they ordered that its move is composed of two different steps. First, like the fers it makes one step of one single square to any adjoining square on the diagonal(s) on which it stands. It can remain on that square or may also continue to any square on the file or rank of that square, maintaining its movement in the same direction away from its starting square until the end of the board or until it captures. Its jumping movement is such that if it begins on a black square, then it will move one step of one square of the same color along the diagonal like the fers and then continue straight ahead as far as it likes. And if it begins on a white square, it moves in the same way. Starting on a black square, then it may not enter the four white squares [fol. 81v] that surround its starting square and likewise if it begins on a white square it may not enter those four surrounding black squares. The Crocodile moves as the modern chess bishop. And the other piece and other side of the king, to his right,  resembles a crocodile, which is a beast and a fish made like a lizard. And it lives in fresh water, notably in the great river called the Nile. And it is so powerful that having its two hind feet and its tail in the water there is nothing that it grabs on land that can escape no matter how strong it may be. And when it wants to grab something it pretends that it is looking somewhere else to lull it into a false sense of security and then it turns quickly and obliquely and goes after it until it captures it. And in this way they made that its piece play in this chess. It moves to any square on the diagonal(s) on which it stands. And if it begins on a black square, then it moves only on black squares and cannot enter a white square; likewise the one which begins on a white square cannot enter a black square. The Giraffe is a (2,3) leaper. This piece is called a Zebra in Fairy Chess terminology. And the giraffe is a large beast shaped like a deer. It has a very long neck and a small head with very beautiful eyes. And its front legs are very long and the hoof cloven like a deers. And it has a short tail and a long black mane. And it runs marvelously fast and before it begins to run it gives a sideways jump and thus is fashioned its movement in this chess after its gait. It leaps to any vacant square three steps on the diagonal(s) on which it stands so that when it begins on a black square it moves to a white one. And the other giraffe on the other side moves in this same manner. The Rook moves as it does in modern chess. And the rook resembles the ranks of soldiers and it plays just like the rook in the other chess. Pawn And the pawns are made like the common people and play in that same way as we described before. 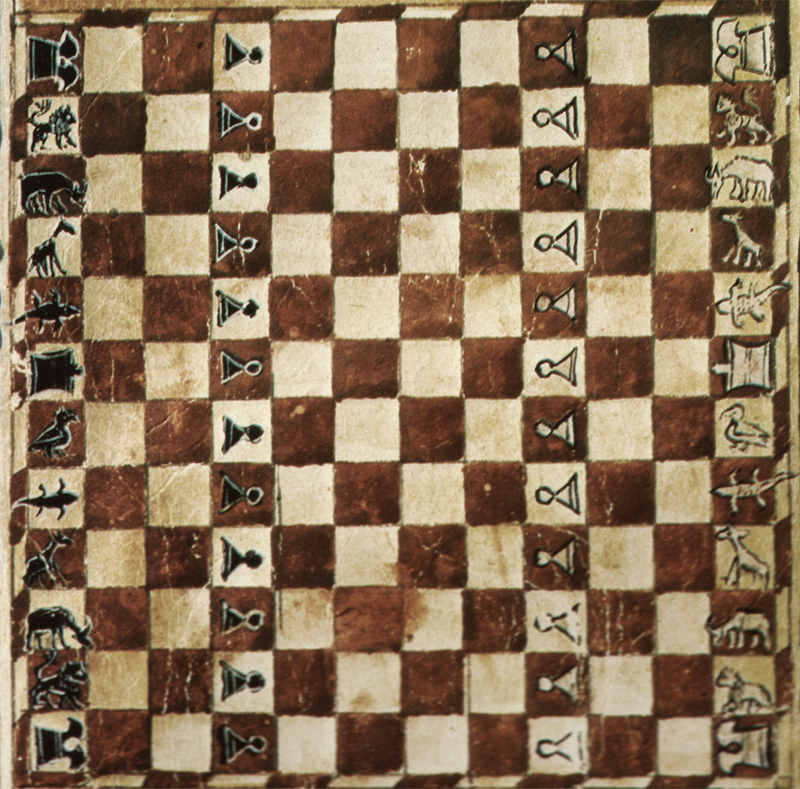 And when a pawn is promoted in this chess it becomes like the piece which is in the square where it was promoted and if it is promoted in the kings square, it becomes an aanca. And the pawns are set up on the fourth rank. And we want to show you the hierarchy where some of the pieces have over [fol. 82r] the others so that he should play with them not sacrifice the greatest piece for the least. And the king is the best and greatest piece as we said above. And beneath the king the aanca is the next best, better than the rhinoceros. And the rhinoceros is better than the rook. And the rook is better than the lion. And the lion is better than the crocodile. And the crocodile is better than the giraffe. And the giraffe is better than the pawn. *Note: interesting that the Lion is indicated to be stronger than the croc (a modern bishop). If indeed the Lion is a (0,3) leaper, then it is a very weak piece (only able to access 16 squares out of the 144 squares on the board! [fol. 83r] Here it speaks of eight-sided dice and how they are made. Because this great chess is played very slowly and they take a long time with it, therefore we, King Alfonso, ordered dice to be with which to play it faster and which show the hierarchy of the pieces by the rolls of the dice. And the dice are made in this way: that there are eight faces on them and each face is triangular so that it has three edges because they could not be made in another way and belong this game. Because however the figure is uneven, it must perforce fall with the flat side facing down; because if it were even it would have to fall with an edge facing up. And so these dice were made with eight sides for the eight types of pieces. And on the first side there are eight pips, on the next seven, and so on down to one. And because the king greatest and best he has the 8, and the aanca the 7, and the rhinoceros the 6, and the rook is 5, and the lion is 4, and the crocodile is 3, and the giraffe is 2, and the pawn is one as we said above on the hierarchy of the pieces. And the same games can be played with these eight-sided dice as for the other six-sided ones, as we have already told in this book. Translated text from the "Book of Games" is denoted by italics. I have followed the word order and phrasing of the original as closely as possible except in the descriptions of the moves. For these, I translate using the terminology and phrasing of the USCF Official Rules of Chess for greater clarity (Bill Goichberg, Carol Jarecki, and Ira Lee Riddle, eds. U.S. Chess Federations Official Rules of Chess. 1975. 4th ed. [New York: David McKay Chess Library, 1993. 1978, 1987]). See the discussion of the aanca in this sections piece commentary. This directional description of the array is true for the white army; the black army is arranged in its mirror image as in modern chess. The LJs description of the giraffes move is so bizarre as to render it nearly unintelligible; no truly diagonal move can result in a change of square color. What is meant here is an expanded knights move of three squares in one direction and two in another. I am indebted to Jean-Louis Cazaux for his help with my translation of the moves for the giraffe, rhino and lion. The manuscript uses the term unicornio despite the beasts two horns. See discussion of the rhinoceros in section 1.4.1.5. Again, I thank Jean-Louis Cazaux for his help with my translation of the rhinos move. Jean-Louis Cazaux disagrees and offers a more appealing move, discussed above, which I very much like but which I cannot reconcile with the original text. Alfonso Xs grant acedrex, ed. Jean-Louis Cazaux, 1 Mar. 2005, .